In 1737, Francis Bancroft, a wealthy city businessman, left the bulk of his fortune to the Drapers’ Company “to establish and maintain almshouses for twenty former Freemen of the Company ............ and a school for one hundred poor boys aged between seven and fifteen”. The boys were to be instructed in “reading, writing and casting accounts”. The Drapers' Company became the Trustees of Bancroft's School, and have since maintained an active and generous connection with the School. The Master and Wardens of the Company still hold an annual visitation of the School, a stipulation of Bancroft's will, although they no longer play the role of the public examiner, as was initially the case. Bancroft’s School was set up in Mile End, London on what is now the site of Queen Mary University of London. The first boys were admitted in 1738. They were all day boys, the first boarders were not admitted until 1802. The site at Mile End proved increasingly unsuitable as Victorian London expanded and the mid-19th century was a period of economic difficulty for the School. The decision was taken to sell the site and move. After a three year stay in Tottenham, Bancroft’s moved to its present site at Woodford Wells in 1889. The fine neo-gothic Quad was designed by Sir Arthur Blomfield and provides a dining hall, chapel, library and classrooms. The Charity Commission insisted that the poor of London retained the right to foundation scholarship, so, until the demise of the LCC in 1964, 50 scholars from the administrative County of London, out of the total of 70 boarding scholarships were admitted to the boarding house. In Woodford, Bancroft’s became part day, part boarding and by the turn of the century the numbers of day boys had risen to 225. They came from a wide area, many taking advantage of the Great Eastern railway, now the Central Line. In 1893 Bancroft’s established a connection with the new Essex County Council which took up scholarships for day boys, a practice which continued until 1977. In 1918 the School entered the newly created Direct Grant Scheme where it remained until the scheme was ended by the Government in 1977. One quarter of all day boys were admitted under this scheme with free places paid for by the local authority, with a further quarter being beneficiaries of Boarding Foundation Scholarships. At the same time, the joining age of the School rose from 8 to 10. In 1944 under the Butler Education Act the joining age rose to 11. 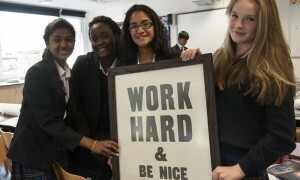 Girls were admitted to the Sixth Form in 1973, the first two arriving that year and, with the end of Direct Grant status in 1977, Bancroft’s moved to full independence and co-education. This meant an increase in the size of the School to roughly 700, with the additional necessary space being created by the closure of the boarding house, which had been under threat for some time, in 1981. This closure was accompanied by the end of Saturday school. Twenty eight girls were admitted at 11 in September 1977 and the number of girls quickly rose to equal the number of boys as the School’s reputation as a strong co-educational day school grew. In 1990, the next major change was the opening of the Preparatory School, housed in an entirely new building on the School site but sharing many facilities, providing education for children aged 7-11. Until 1997 Bancroft’s participated in the Government’s Assisted Places Scheme with ten assisted places in each year and a further five at Sixth Form level. The School has replaced these assisted places with Scholarships, known as Francis Bancroft Scholarships, of its own at 11 and has secured funding from an Old Bancroftian for an additional two half scholarships at Sixth Form level. In 2012 the School marked its 275th birthday and launched the Bancroft’s Foundation at the Drapers’ Hall. The Foundation exists purely to raise money to increase the number of means tested scholarships at the School, echoing our founder’s wish to educate those “hundred poor boys”. These Foundation Scholarships are awarded to bright children, who show the potential to do well at Bancroft’s but whose families’ finances would otherwise prevent them from joining the School. 275 years later, the School which bears Francis Bancroft’s name continues to flourish. 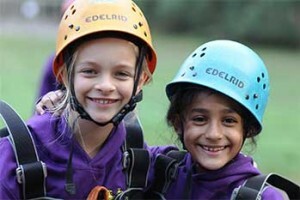 It’s a very different community from the one which Bancroft envisaged: now situated in a beautiful Victorian building on the fringes of Epping Forest, Bancroft’s provides a first class education for over a thousand pupils, both boys and girls, aged from 7 to 18. 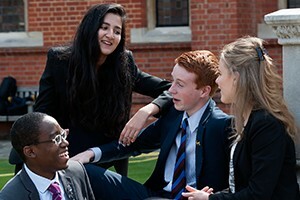 The school is committed to providing excellent value for money, as well as offering scholarships and bursaries to those who could not otherwise attend the school.